Several years ago my friend Lesley came over to make me dinner, and she made these unbelievably delicious tostones with mojo sauce. If you’ve never had them, tostones are a Latin American side dish of double-fried, flattened green plantains, traditionally served with tangy, garlicy, mojo sauce. 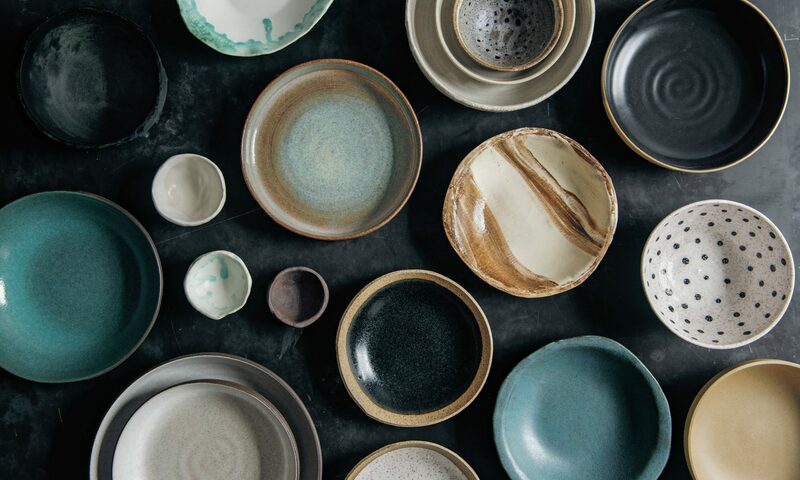 They’re simple, and it’s difficult to explain what makes them so great. Certainly the “double-fried” aspect doesn’t hurt—the tostones themselves are sort of a cross between a fritter and a home fry–but the kicker for me is the homemade mojo sauce. I’ve been craving them for a while, so I asked Lesley to make them again, and this time I was ready, pencil and camera in hand. Plantains are technically a banana variety. They resemble bananas in their shape, peel, how they grow in bunches on trees in tropic climates, and have the same botanical makeup. But I happen to loathe bananas—they’re one of the few foods that I unequivocally dislike, and that Lesley and I share this opinion is one reason we get along so well—but I don’t loathe plantains. The texture of a green plantain is starchy like a potato and its flavor is very mild. Yellow plantains are simply more mature, and while they take on a slight banana flavor and softer texture, I even like them—especially as maduros, a preparation in which they’re caramelized. It seems that the banana—per Wikipedia, the “dessert banana”—is ripened a step further than the yellow plantain, such that it doesn’t need to be cooked. In any case, plantains are easiest to find at supermarkets that cater to Latin American communities. To make the tostones, the plantains are peeled—the skin isn’t quite as pliable as a banana; you must make a slit the length of it, then, digging your fingernails into to the cut, pry it off—chopped into 2-inch pieces, and fried in a not negligible amount of oil until you can tap on them and they sound hollow. (This tapping thing is a trick Lesley taught me. I was skeptical at first, but once you tap on one that’s done and compare it to the sound of one that is not done, you’ll realize how accurate an instruction is.) Then they’re drained on paper towels, flattened, and—here is an important tip Lesley picked up from a friend along the way—dipped in cold water, and then fried again. This all happens relatively quickly, so per her advice, we assembled the rest of the meal first, and then got to work on the plantains. 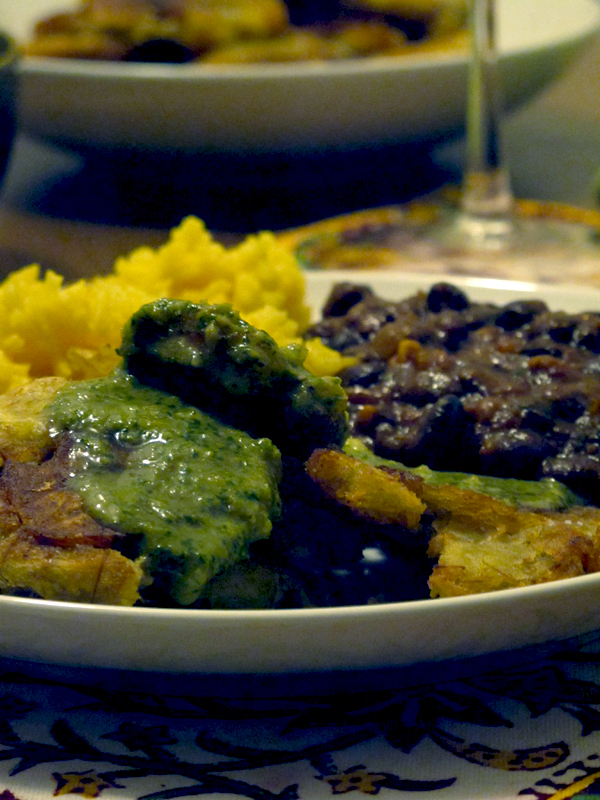 Tostones are more of a side than a main dish, so we ate them alongside black beans and yellow rice. Mojo sauce can be made in any number of different ways, though it typically includes sour oranges and loads of raw garlic. I couldn’t find sour oranges, so we tried out blood oranges (which we cut with some lime juice) and were pleased with the results. Lesley likes the addition of cilantro, and I do too, so we added a handful into the sauce as well. This mojo is addictive, but you may want to warn your loved ones to brace themselves after you eat it, because that kind of garlic has its consequences. 1. Prepare the mojo sauce. 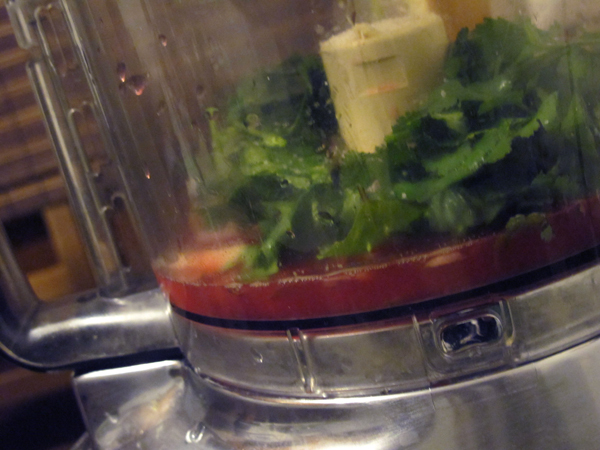 Combine the juices, garlic, shallot, cilantro, cumin, and salt in the bowl of a food processor. Puree until liquefied. With the motor running pour in the oil in increments, until desired consistency is reached (you may want to add more or less). The sauce should be emulsified and somewhat thick. Taste and adjust seasonings if necessary. 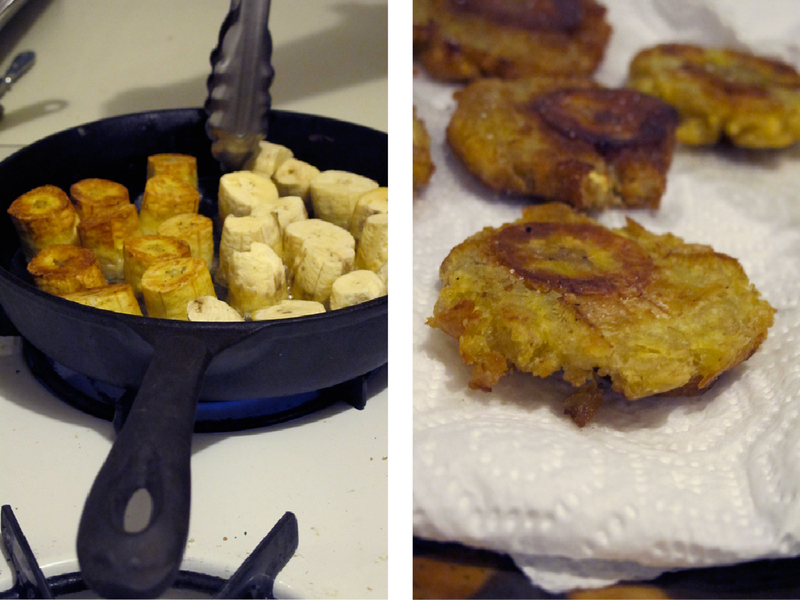 Transfer to a serving bowl and allow to stand for at least 20 minutes, while you prepare the tostones. 2. 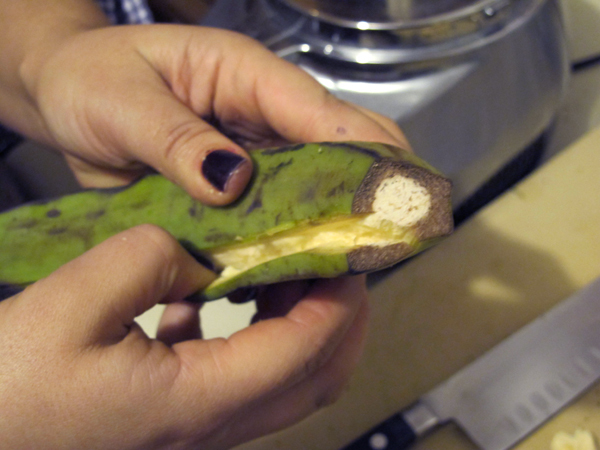 Make a slit down the length of each plantain and, digging your fingers underneath the peel, pry it off in strips. Trim off the ends if they appear to be discolored. Discard the peels and slice the plantains into 2-inch pieces. 3. Heat at least 1/4-inch oil in a wide skillet over medium-high heat. Test the temperature by placing one plantain piece in the oil; it should begin to sizzle immediately. Add the plantains in a single layer, with flat sides down, and cook for 2 to 4 minutes, until golden on the bottom. Using tongs, flip them and cook for 2 to 4 minutes more. They are done when you can tap them with the tongs or your fingernail and they sound hollow. 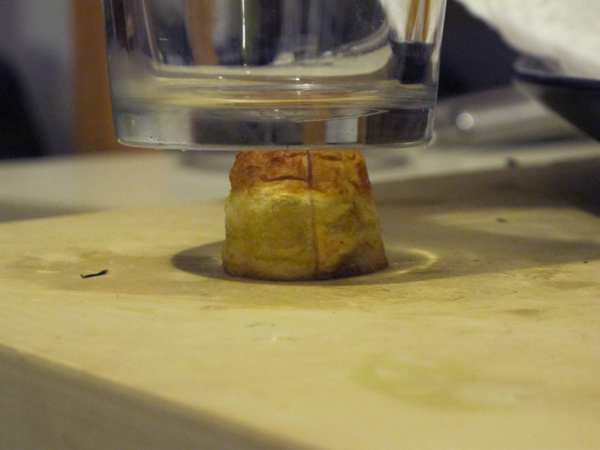 Transfer to a paper towel-lined plate or a flattened brown paper bag to drain of excess oil. Remove the skillet from the heat, but do not discard the oil. 4. Place the plantains on a clean cutting board or work surface, and arrange a few of them so that they’re standing upright on their flat ends. Using a sturdy, flat object, like a glass or mallet, press down on each one and flatten it to a thickness of about 1/4- to 1/2-inch. Transfer to a plate and proceed in the same manner with the remaining plantains. 5. Set a bowl of cold tap water next to the stovetop and bring the oil in the skillet back to medium-high heat. Dip a flattened plantain in the water, shake off any excess, and then add it to the hot skillet. (It will sizzle a lot, so stand back.) Repeat in batches of 5 or 6, so that the plantains fit in the skillet in a single layer. Cook for 1 to 2 minutes on each side, until slightly browned and crisp. Transfer to a paper towel-lined plate or a flattened brown paper bag to drain of excess oil. Sprinkle with a generous amount of salt, and proceed with remaining plantains in the same manner. 6. Serve hot, passing the mojo sauce at the table and spooning it over the tostones. I loved the recipe so much it immediately went onto my menu plan and quickly onto the table. I had a snag when I was not able to find proper green plantains, but it seems the semi-ripe ones turned out ok too. I know you noted that the acidic nature of the lemon/limes were necessary, but I found my blood oranges to be really zingy. Great recipe, love the blog! With green plantains, instead of trying to peel the whole plantain, it is easier if you slice the chunks in two-inch pieces first and then cut a slit in each chunk and peel. I have made my mojo with sour oranges and key limes but will definitely try this one with Blood Oranges, sounds great!